Nice! How about that familiar foe they said would be coming this month? People already figured out Thrawn is returning Oct 7-14. Sure wish I could see the "Behind the Curtain" forum..
How about instead of reworking a new faction that has been out less than 6 months they fix some of the older characters that are terrible like Jedi, Separatist, Droids, etc. Get off the LS/Rebel's junk and show some DS love for once. Why there is no ufficial information but a video on YouTube? Shouldn’t you guys keep update everyone via forum? Chances the Thrawn event is harder? Exactly. I love how months ago they claimed that Grievous was in line for a rework (this was before Phoenix was even out), but their list was long. Obviously that was not true. The community keeps saying enough with rebels, and they acknowledged the community was sick of them in the June podcast, but they just keep focusing on them. I enjoy using Phoenix, but not at the expense of screwing over the dark-side over and over,and over again. So many more needed factions. 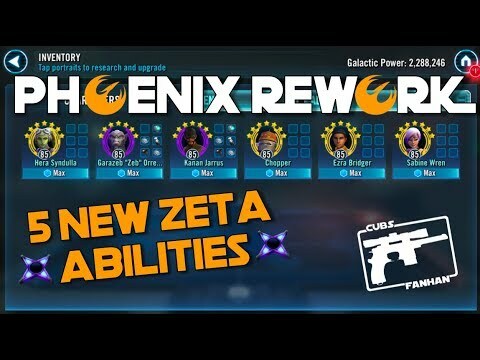 Why is Phoenix getting zeta before toons like Palpatine? Makes me wonder if a feature could be added so I could sell all my ds toons to the shard shop and recover some of the credits, gear, and ability mats I apparently wasted on them. This. This rework is so stupid. Yeah, really. I want my zetas back for Vader, Sidious, Kylo Ren, Nihilis (x2), and Savage since CG refuses to make the Dark Side good for anything. Nightsisters? Yeah, they kind of fall into the same category as Ewoks. Fun to use, but not a major faction for anything so they cancel each other out. Why it WOULD be harder dude? Doesn't HAVE to be harder (since it was already pretty hard), but they COULD make it harder since they buffed the Phoenix characters pretty decently. Like, they are now the squad people assumed they would be when they were first revealed on paper. The LS/Rebels focus probably has to do with TBs....and for Phoenix, also Thrawn coming back, start of Season 4 of Rebels and their specific requirement for TBs. Phoenix upgrades make TBs and Thrawn event easier so that’s good. Plus, they gave an obvious hint that this was coming with the last content update. No one should be surprised by this. Why would they nerf the Thrawn event? Yoda event is still extremely easy, it hasn't been made more difficult despite the appearance of protection, zetas and mods (I did it with the worst jedis in the game, at gear 8 level 70 without a single mod). The second time Yoda came around, yes, it was ramped up. So what people had expected to clear it with after all their farming waiting for the second appearance, they were instead getting absolutely stomped with. In response, ea/CG had to scale the event back. Additionally, it was a stealth buff to the event with no prior information given. You clearly weren't around for that. That is true.....but seems they learned their lesson after that as Yoda was never made more difficult again and Palpatine and R2 have never been made harder. So it wouldn’t be completely unprecedented but extremely unlikely based on how these events have been handled since then. Also, what are they going to tune it for 5 zetas? Who can add 5 zetas in the next few days? Thrawn is back on Oct. 7. 1) Where does is say he's back 10/7? 2) They don't have to ramp it up for Zetas, but they made them overall just better in general. For the record I don't think they will boost it's difficulty. Other than the ramped up Yoda event (which somehow I beat) it was the hardest of the Legendary events in my opinion. No need for a boost. Sorry if I missed it, but aside from the Chopper assist, how are they better without the zetas? Hmmm...maybe I misunderstood the video then. I thought they all got boosted some with tweaks. I could be wrong on that (other than Chopper). Yeah I dunno I didn't watch the video, just read the text in Kozi's post. I don't understand why they do some of the things they do, this looks like total marketing right here.